A few weeks ago Google made headlines with the launch of the new Chromebook Pixel, the highest-end Chromebook on the market (and with a price to show for it). 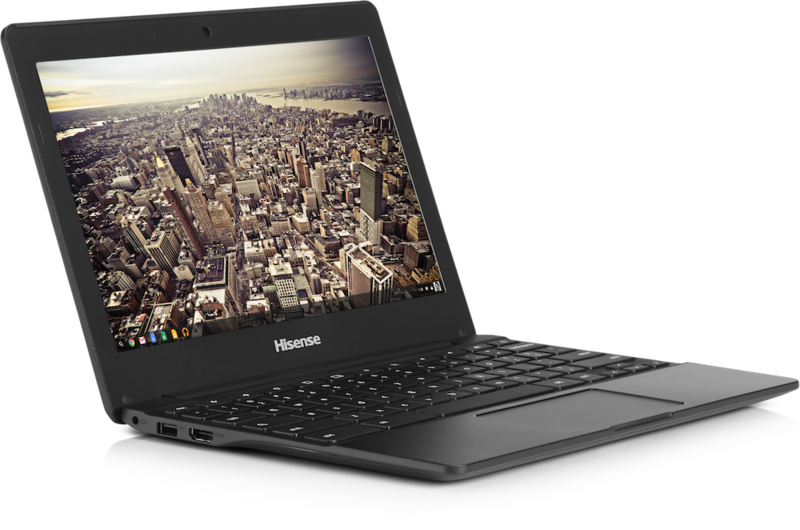 Today, the Chrome OS laptop ecosystem is launching two products that are the exact opposite: the Haier Chromebook 11 (now available online at Amazon) and the Hisense Chromebook (now available at Walmart). Both of these 11.6-inch Chromebooks will retail for $149, making them the most affordable Chromebooks yet. In addition, Google today announced that Asus plans to launch a $249 convertible Chromebook/tablet soon, as well as the Chromebit, a fully featured Chrome OS-based computer on an HDMI stick, similar to Intel’s Compute Stick. The launch date for these two products is unclear. 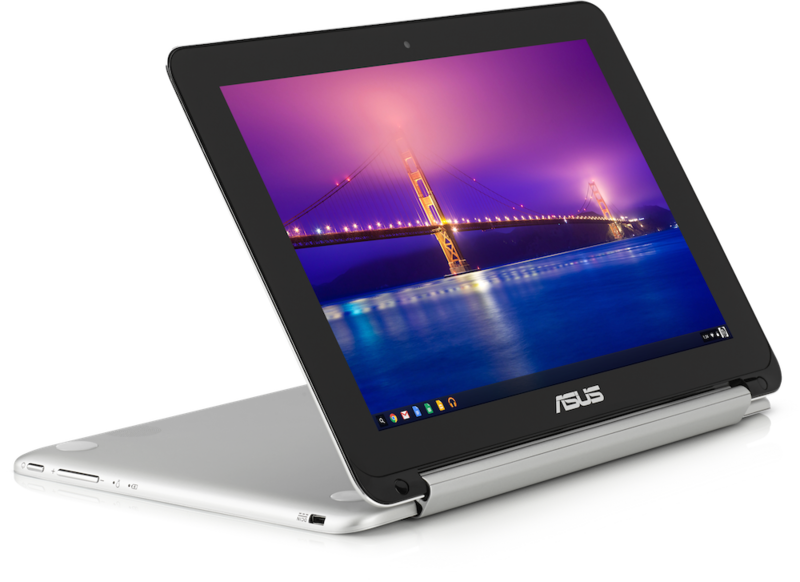 Also coming down the pipeline is the new 11.6-inch $169 Asus Chromebook C201. That one, too, is based on the Rockchip quad-core processor and will also come in 2GB and 4GB versions. It’ll go on sale at Amazon in May. The new Chromebooks from Haier and Hisense are powered by Rockchip‘s 3288 system on a chip (SoC). Chances are you just did a double-take when you read that. Rockchip isn’t exactly a household name, after all. But this company isn’t some fly-by-night outfit. The company, which was founded in 2001, is one of the leading fabless semiconductor firms in China and recently signed a strategic agreement with Intel to incorporate its Atom cores into some of its products. The 3288 SoC is an ARM chip, however, based on the 32-bit quad-core Cortex 17 design. For most use cases, the 3288 should offer decent browsing speeds. We haven’t been able to see it in action yet, but it outperforms some of Intel’s recent Atom chips in many benchmarks. The basic specs for the Hisense and Haier Chromebooks are essentially the same: 2GB of RAM, 16GB eMMC flash storage. Both feature two USB ports, and SD Card reader and HDMI output, as well a 720p webcam and WiFi and Bluetooth antennas. Both devices support Google’s always-on “OK Google” voice commands and come with Google’s slightly modified Chrome keyboard. Besides the $149 version, Haier will also offer a second version of its Chromebook with a larger — and removable — battery that promises 10 hours of battery life. For the regular version, Haier promises 10 hours of battery life, and for Hisense, eight-and-a-half. The display is often the major negative of cheaper devices. Rockchip promises that its built-in GPU can handle 4K video, but the display on these new devices isn’t all that close to 4K. The Haier Chromebook weighs in at 2.54 lbs (similar to an 11-inch MacBook Air), and the Hisense one at 3.3 lbs (that’s exactly the same as the Chromebook Pixel). Both Haier and Hisense note that while the devices are cheap, they will still be sturdy. Hisense, for example, has added a metal palm rest to its machine, which should make it feel better than some of the more expensive plastic Chromebooks (we should get a review unit soon). With the launch of these devices, the Chrome OS ecosystem pulls side-by-side with the Windows world, where Microsoft reportedly hopes its OEMs will also offer $149 laptops based on Windows 10 soon. 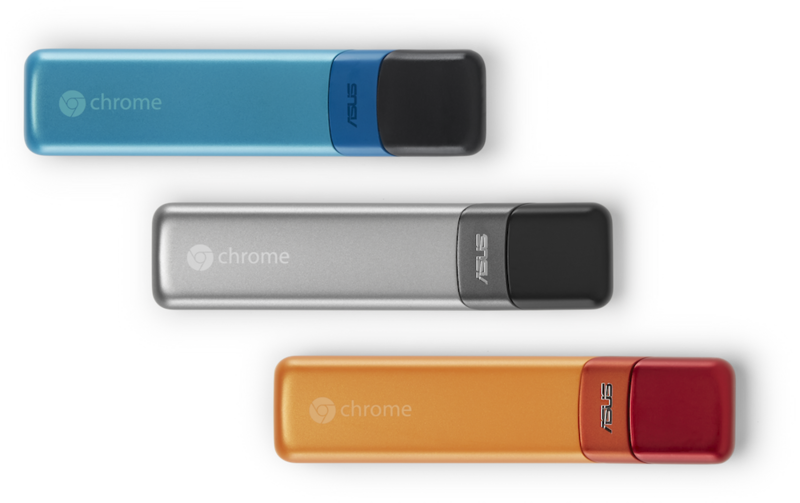 The Asus Chromebit, which should retail for under $99, is also a Rockchip device with 2GB of RAM and the same 16GB of eMMC flash storage as the Chromebooks. It’s basically a Chromebox on a candy bar-sized stick (I’m actually surprised it’s not called the Chromestick). As an HDMI stick it’s clearly targeted at enterprises that may want to use it for mobile workers and maybe companies that want to use it for in-store displays (Google already has a similar program for Chromeboxes, after all). I’m pretty sure there will be quite a few hackers who will want to play with the device, too.